Posted by Mike Gospe in Integrated Marketing, Just for Campaign Managers, Lead Gen, Marketing Operations. How does our marketing communications objectives fit against the customer’s buying process or our selling process? This is a weighty question that can be tough to decipher. 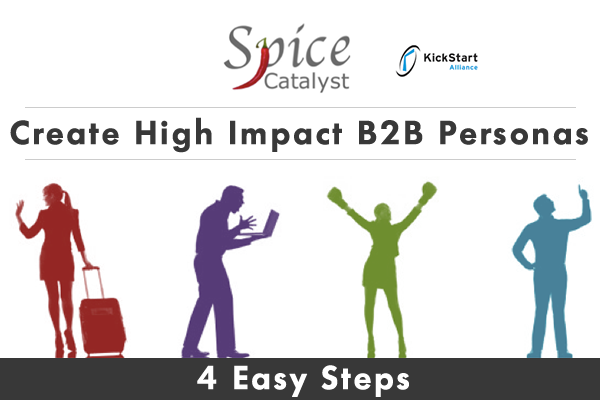 Here’s a handy overview with respect the selling into the B2B technology market. An overlay of communications objectives to the corresponding stages of the customer's buying process and a company's sales process. Although generic, this graphic provides some relevant context for marketers selling to B2B. I titled this graphic “Mapping Customer Perception” because that is our goal, ultimately. Marketers strive to influence how prospective customers think. To do that, we need to understand how and when to guide them. First, they must be aware of who we are and the solutions we offer. Then we want to hook them and engage them as they become interested. Next, we need to build understanding and become a credible source of information. And, finally, we want to entice them to take action and purchase our products and services. 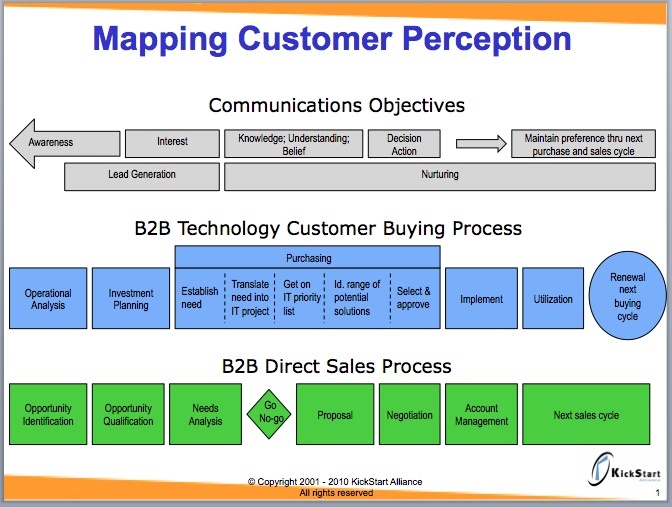 In an ideal world those communications objectives would map directly to the B2B Technology Customer Buying Process. For example, the best time to hit the prospect is early in their buying process, when they are doing an operational analysis or building their budget during the investment planning phase. Once we’ve got their attention, we want to provide relevant content throughout the purchasing cycle. If we can guide the outline of the RFP we stand a better chance of winning the deal. Next, let’s overlay both those processes with the ideal B2B selling process. It’s no coincidence that the sales process is a reciprocal of the buying process: the sales rep wants to identify and qualify opportunities as early as possible. They want to work with the prospect as they are establishing their needs in order to determine if there is a potential fit. Reaching the “go, no-go” decision point prior to generating a proposal is preferred so that time isn’t wasted. Sales will negotiate with prospects as they are selecting and making a final purchase decision. The sales process doesn’t end there. While the solution is being implemented, the able-minded sales rep will be following-up and conducting account management duties, all the while looking for opportunities to engage the next sales cycle. If life were simple, these three processes would overlay nicely. But life is like a Rubik’s Cube. Each of these processes are not static, and they don’t always start at the same point in time. That is why marketing is an ongoing processes, constantly creating awareness and offering opportunities for the prospect to raise their hand and engage us on their terms. When they are ready. Have ideas on how to make this graphic better? Let me know. I welcome your input and feedback. Posted by Mike Gospe in Just for Campaign Managers, Marketing Operations, The Marketing High Ground. We’re celebrating the 10 year anniversary of Marketing Campaign Development! Thank you for being part of the MCD family of more than 100K views from marketing teams around the world. Interested in getting some feedback on your latest plans? During 2018, I’m offering a free 1 hour marketing consultation to the first 10 people who sign up. Contact me to schedule a video conference where we can chat about anything you like: launch plans, campaign strategies, blueprint creation, campaign manager coaching, navigating internal politics, whatever. It’s a free hour for you, and it’s an opportunity for me to say thank you! Do we really need a positioning statement? Posted by Mike Gospe in Integrated Marketing, Marketing Operations, Marketing Persona, Messaging. January is the perfect time to conduct a marketing assessment. Take a moment to look back at last year’s plan. How well did your marketing campaigns work last year? What worked well? Where were your surprises? What elements of planning and execution require improvement? Whether you decide to conduct your own assessment or hire an outside expert to facilitate the process, here are a few tips to get you started. Posted by Mike Gospe in Marketing Persona, Messaging, Positioning, workshops. Posted by Mike Gospe in Integrated Marketing, Just for Campaign Managers, The Marketing High Ground. Posted by Mike Gospe in Integrated Marketing, Just for Campaign Managers, Marketing Operations, The Marketing High Ground.